What is the song “Not Enough Whiskey” about? Feeling better all the time! Doug Adkins, singer-songwriter from Montana/USA, will release his new album “Dirt Roads And Fence Lines” on April 30, 2018. Don`t miss the next concerts. If you don`t want to wait so long to experience a great live performance and a perfect mix of Americana Music, order the new album “DIRT ROADS AND FENCE LINES” now! Doug Adkins is touring with his new album “DIRT ROADS AND FENCE LINES” through EUROPE this year. Don`t miss the chance to see his powerful show, packed with traditional and modern country songs – a mix between the classics of Americana, Classic Rock, Country and Blues we all love! As a songwriter of 8 original CDs, all these types of music have influenced Doug Adkins writing so it is natural to bring those elements into his shows. With a rich, deep voice and distinctive style, Montana country singer-songwriter Doug Adkins is releasing his new album “Dirt Roads and Fence Lines” on April 30th, 2018. After being on stage for more than 20 years Doug Adkins will release his ninth studio album “Dirt Roads and Fence Lines”. Take the chance and preorder the new album here. You can watch the video to the first Single “Second Hand Heart” here. If you like to dance, Marianne Jakob from the White Eagles made a linedance called “Let me into your heart” … so let`s get on the dancefloor! The Linedance video you can watch here. Doug Adkins grew up in Montana. For his 18th birthday Doug Adkins got his first guitar and wrote his first song on it the next day. Since then, he has been writing songs … over 200 songs till today. Get ready for the new album “Dirt Roads And Fence Lines” and save the first copy for yourself. You can preorder right here and take one of the special offers home with you. With a rich, deep voice and distinctive style, Montana country singer-songwriter Doug Adkins is releasing his new album “Dirt Roads and Fences” on April 30th, 3018. After being on stage for more than 20 years Doug Adkins will release his ninth studio album “Dirt Roads and Fence Lines”. Take the chance and preorder the new album here. Get ready for the new album “Dirt Roads And Fence Lines” and save the first copy for yourself. The official video to the Single “Second Hand Heart” you can watch on YOUTUBE. We hope you enjoy the new song “Second Hand Heart” written by Doug Adkins. DOUG ADKINS releases his new album “Dirt Roads And Fence Lines” in less than 100 days!!! Doug Adkins, singer-songwriter from Montana will be back soon with his newest album, Dirt Roads And Fence Lines, which will be released on April 30th, 2017. If you can`t wait, preorder the new album – full of traditional country music – here! Take the chance and order NOW! Have a great weekend, hope to see you at one of the next concerts! Doug Adkins, traditional Country Music singer and Songwriter is writing his own lyrics. Next month his Single “Second Hand Heart” of the new Album “Dirt Roads And Fence Lines” will be released. For this CD, “Dirt Roads And Fence Lines” Doug Akdins wrote all 12 songs in about 2 1/2 weeks, so he had paper everywhere to the point that you wouldn`t know which piece of paper went with which song! But finally it got all sorted out. Today we want to share the lyrics of the new Single that Comes out on February 1st, 2018 – SAVE THE DATE!!! 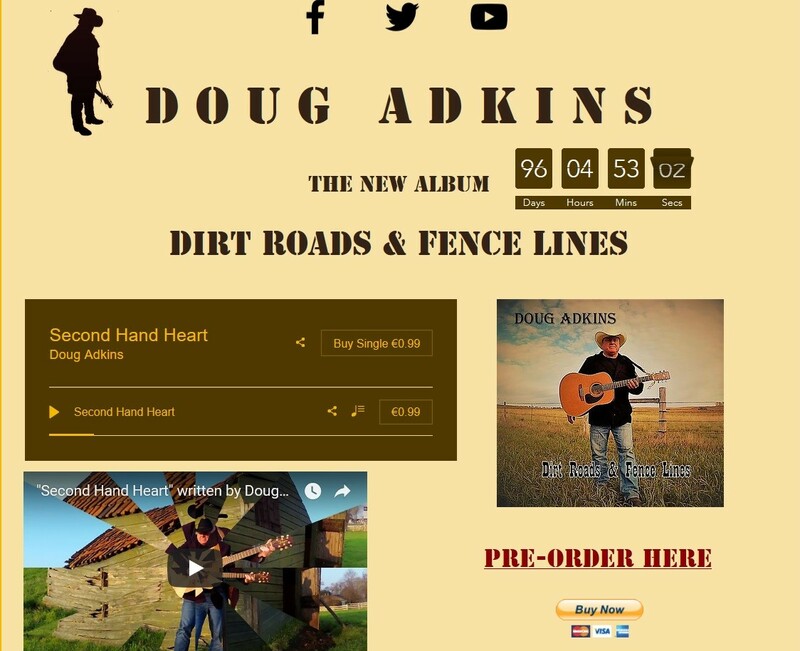 You can pre order the new Album “Dirt Roads And Fence Lines” at http://www.dougadkins.com and you will receive it 2-4 weeks before the public! “Dirt Roads And Fence Lines” – What is the meaning of the CD Title? For everyone who grew up in the Midwest or the Northwest of the United States, or for that matter anyone who has spent some time in the country and loves country music, you will appreciate a lot of the songs / themes on this CD “Dirt Roads And Fence Lines“. For those who didn’t, my hope is to bring you along for 12 songs and give you a little look at what it was like to grow up in a small town in Montana. Where I grew up, dirt roads are more common than paved roads. Who wouldn’t love to jump in a 53 Chevrolet Pickup Truck and just head on down that dirt road for as far as it goes, for as far as you can see in any direction? Old Fence lines are even more interesting as they “just go on for mile and mile, standing there strong, bold, meek and mild,” (from the title track Dirt Roads and Fence Lines). If you stand along an old fence line and look for as far as you can see, you will notice that somewhere off in the distance “where the sunset meets tomorrow”, it blends into the horizon and disappears! Every song on this CD is from life as I find it. I write all my own lyrics and I’m happy when you get a copy of this CD at www.dougadkins.com and take a look at the perfect way I grew up, but as I say, if you grew up where I did, you will appreciate a lot of the themes on this CD. You can preorder the new album “Dirt Roads And Fence Lines” HERE! In 2005 Doug Adkins recorded the CD Whiskey Salesman in Nashville and released to radio in the U.S. and in Europe. In Europe Whiskey Salesman was #1 for 4 consecutive weeks on the Hot Disc Charts that went out all over Europe, Australia, New Zealand. As a singer-songwriter in need of a hit country song, that song gave a kick start to a slow moving career and Doug Adkins immediately was touring 100+ country concerts per year. During the recording of that CD he met a couple of the Nashville Greats, musicians such as Mike Chapman, Lonnie Wilson, Brent Mason and others. “Mike Chapman who played bass guitar and produced the sessions became a good friend of mine and was one of the nicest people I’ve ever met. Sadly enough, Mike passed away year before last and is truly missed! I also met Brent Mason (Electric Guitar) and Lonnie Wilson (Drummer – Producer), and this album “Dirt Roads And Fence Lines” marks the 4th time we have gotten together to make some Country Music together! Brent Mason has the hit country guitar CD “Hot Wired” as well as being the most recorded country guitar player in history and having won CMA guitar player of the year 6 times. Lonnie Wilson is the former lead singer from the band Bandana which charted 10 Hot Country singles from 1982 to 1986. Now Lonnie Wilson has arguably the hottest drum sound in Nashville, making him the go to guy for the new CD “Dirt Roads and Fence Lines”! Also working with Doug Adkins on his new album “Dirt Roads and Fence Lines” were Scotty Sanders on Steel Guitar and Jimmy Carter on Bass Guitar. Scotty Sanders has one of the sweetest steel guitar tones period! He has recorded with hundreds of Nashville artists including Charley Pride, Randy Houser, Sammy Kershaw, Joey+Rory, Trace Adkins, Dean Brody. Jimmy Carter is a legend and has a one of a kind sound and drive. His great reputation led him to work in the studio with renowned artists such as Toni Braxton, Dierks Bentley, Tim McGraw, Alan Jackson, Dustin Lynch, George Jones, Nancy Sinatra, and of course Doug Adkins . Pre order CD`s, Vinyl, T Shirts, Coffee Cups and more at www.dougadkins.com. With a rich, deep voice and distinctive style, Montana country singer-songwriter Doug Adkins is releasing his new album “Dirt Roads and Fences” on April 30th, 2018. “Hope you had a great start for 2018! Looking forward to seeing you out on the road this year. After a year full of shows with packed houses, Montana Country singer-songwriter Doug Adkins, is getting ready for 2018, leading to more great events in Europe with a year-long lineup of shows and releases his new album “Dirt Roads And Fence Lines” on April 30th, 2018. For more information check out the website of the traditional country music singer-songwriter Doug Adkins. If you like, you can preorder the upcoming album “Dirt Roads And Fence Lines” here – special offers are waiting for you. All genre Nashville entertainment and lifestyle site.